Finally, A Cheap Valentine Flower Delivery Online Store. Cheap Valentine flower delivery - This past year I was determined to find an online store that wasn't going to cost a fortune to send my loved ones a little love through the mail. To me, there is something exciting about receiving things via snail mail. I feel like it's almost a lost art. Well, maybe not. But it sure does scream, "I'm thinking of you!" To keep the cost of Valentine's day down, each year we chose someone from our family to spoil. This individual or family gets sent either chocolates, flowers, a coffee cup, or a teddy bear. The remainder of our family is sent homemade Valentine's cards made by my kids. This Valentine's Day tradition is special and highly anticipated by my children. This year we chose one of their Aunts because she had a baby and we felt this was an extra special year for her. You can be creative with this!! You can collectively chose a family member or draw a name out of a hat. Enough with our family traditions. ;) Maybe you are looking to just send a gift to a special someone. 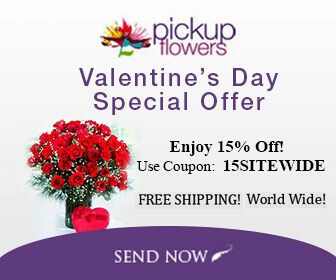 We love Pickup Flowers because it sends gifts internationally for every occasion. Shipping is sometimes free, but always low. I was shocked at some of the delivery costs associated with some companies. If you want to send a bouquet of flowers for $19.99, and then the shipping is $19.99 on top of that!! A little ridiculous, if you ask me. So, I was excited to find a cheap Valentines flower delivery store. Pickup Flowers lets you filter by price and type of gift. We've really been blessed by this when needing to keep the budget low and find something unique for different occasions. Last year we sent a coffee mug with an endearing saying on it. It was $15.95 total without a coupon! I felt this was a very affordable way to say I love you. And, it is something their Aunt will be able to keep for a long time. Thus, prolonging the love. Sorry, I'm a bit cheesy but I love Valentine's Day for this very reason. We could all use a little more love. :)Below is a coupon code for 15% off. We hope you have a very special and blessed Valentine's Day!